Designed by DEZIGNLINE™ and sold exclusively by Dero, STEELGREEN™ Planters are designed to create safer streets. These 4-foot long multi-purpose planters are perfect for bike lane buffer zones: protective, green, portable, and customizable to promote community identity. Manufactured by Dero with 100% steel and galvanized for rust resistance, the strong, durable basin is available in numerous colors, and their forklift-ready base can be anchored to the surface for added stability. Planters are also appropriate for transit corridors, streetscapes, pedestrian malls, urban plazas, corporate and academic campuses, and more. For bike lane buffer zones at signalized intersections, add the PEDISTILL® Hand+Foot Rest, an optional accessory that turns STEELGREEN Planters into convenient red-light rest stops. Bicyclists grab, hold, and enjoy staying on their bikes while waiting for the green light. Available in galvanized finish, choose the hand rail, the foot plate (complete with non-skid surface), or both. STEELGREEN Planters are customizable. Basins are available in a galvanized finish, or in a color that reflects your community’s branding. Optional ARTPANELs (galvanized or color) are 24”L x 8”H removable steel panels featuring a standard bicycle graphic, city logos, or other custom imagery and even advertising. 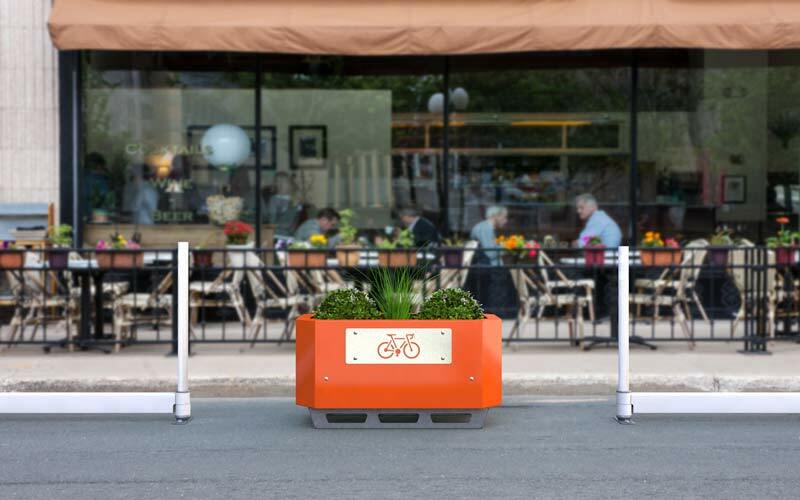 For streetscape use, STEELGREEN Planters can be ordered with galvanized locking rails around the top rim to make bike parking and locking easy. STEELGREEN Planters are a part of the Streetscapes product line, which also includes BIKERAIL. Cities can quickly and easily combine STEELGREEN Planters with BIKERAIL sections to create highly protective and aesthetically pleasing bikeway corridors. STEELGREEN™ Planters are patent pending.